An essential gift showcasing the range of great cheddars offered by the farmer owners of Cabot Creamery! 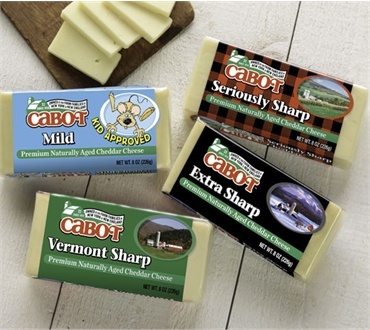 Mild, Smooth Sharp, Extra Sharp, and Seriously Sharp 8oz bars provide the perfect introduction to the world's best cheddar! Not only is this a good gift, it is perfect for get together. Great for a snack with crackers, in a sandwich especially grilled cheese.